Other names: Delicious monster, windowleaf. Mostera is basically a house plant grown indoors for its foliage. 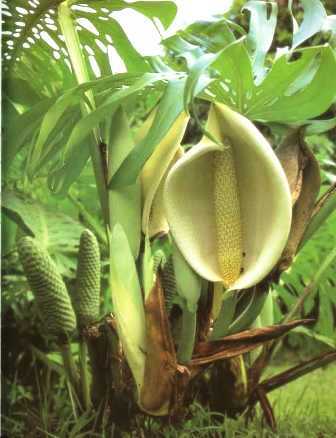 As it bears delicious fruits too which taste like a mix on pineapple and banana, so it is being grown for fruits too. 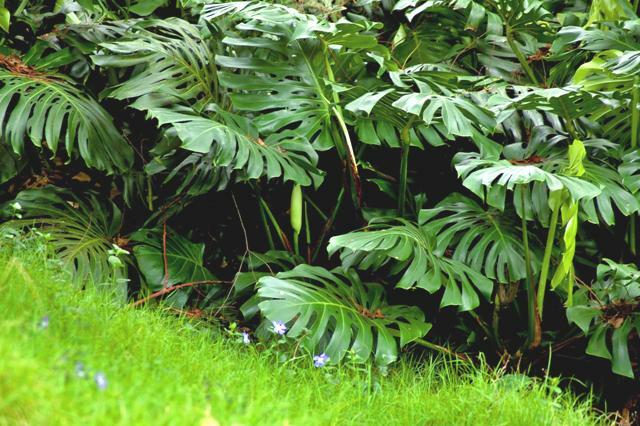 Though it is a tropical plant having its origin in Central America, but it is even grown in England for its fruits. They grow it in green houses. Now it is cultivated outdoors for fruits in Central America, Australia, California, South Florida etc. A sparingly branched evergreen liana that climbs high upto 20 m into the rain forest canopy, attaching itself to trunks and branches and supporting itself above the ground with long tentacle-like aerial roots; aerial roots grow downward out of the thick stem and take root where they touch the ground. Leaves of a young plant heart shaped and without holes; often overlapping and clinging, closely to a tree trunk; plants in that stage are called shingle plants; older plants develop the characteristic split and perforated adult leaves that stand away from the supporting tree trunk. Inflorescence a creamy white Jack-in-the-pulpit-like spadix and spathe; spadix a fleshy upright spike, 20.3-30.5 cm long, with tiny flowers on it; spathe a boat-shaped bract that surrounds the spadix (the pulpit). Spadix swells into an aromatic fruit that looks a little like a green corn cob. The fruit takes a little over a year to mature. The fruits are delicious. These can be eaten on its own or added to fruit salads, purees and fools. It can be sliced and served with ice cream as a tasty dessert. 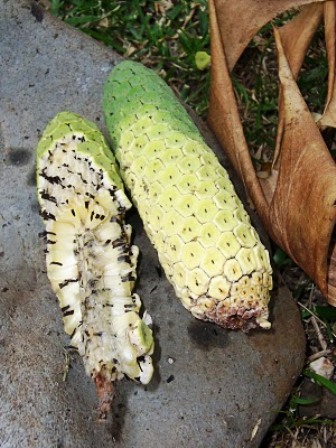 As in pineapple, numerous sharp crystals are present in monstera pulp too, which irritate the mouth, especially when the fruit is not fully ripe. 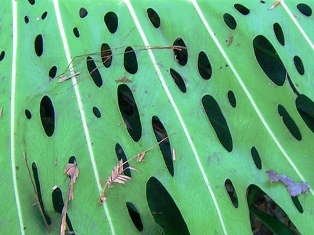 Monstera fruits contain 16% sugar (70 kcal 100g) and are said to be rich in potassium and vitamin C.
Monstera plants require high humidity, constantly warm temperatures and bright, indirect light proper growth and fruiting. Plants cultivated for fruit should preferably be planted on the ground in half shade. 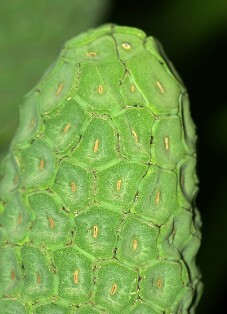 This fruit is propagated from cuttings. A short piece of the stem will readily take roots when planted. The fruits are left on the plant until they are fully ripe. Maturity is indicated by fruity smell and the small green peels or lids dropping off.